I don’t know about you, but I feel like we have just witnessed the beginning of a new era. The Internet stood up to Congress and to the Senate and won. We have defeated SOPA and PIPA. Big corporations represented by MPAA (Motion Picture Association of America) and RIAA (Recording Industry Association of America) sponsored those bills and they spent huge amounts on lobbying in Washington. They were so close to having their wishes granted and then, unexpectedly, a spontaneous grass-root protest movement organized with the help of the Internet defeated them. Of course this is not Libya or Syria — people’s lives are not in danger, our system is based on democracy, and we have our rights. But those rights sometimes need defending. I don’t expect everybody to spend time studying SOPA and POPA in depth, but we (still) have the Internet to provide intelligent explanations and summaries. I like this short video by the Khan Academy. It explains in simple terms what a disaster SOPA and PIPA would have been if they were written into law. So what has just happened? A group of people — programmers, content providers, the Internet crowd — suddenly realized how much power they have, and were able to put politicians on notice. The Big Blackout of 1/18/2012, with the participation of major sites like Reddit, Wikipedia, WordPress, and many others, was extremely effective. Those sites took a big risk, and they succeeded because of overwhelming support for their actions. But as Wikipedia says, the fight isn’t over yet. I’m sure MPAA and RIAA are hard at work trying to sneak another law that would give them power to block any site on a whim and without recourse. We should remain vigilant. But, in the meanwhile, why not rectify some mistakes from the past? Don’t get me wrong, content creators deserve copyright protection. Just like inventors deserve patent protection. Patents expire after 20 years; but the Mickey Mouse Law provides copyright protection for a century. This is how long we have to wait until copyrighted material enters public domain. Walt Disney is long dead but every time the copyright on his works nears expiry, the Congress enacts a new law that extends its reach. 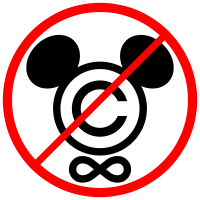 If I drew a Mickey Mouse in my blog I’d be sued by the Disney estate (and, if SOPA passed, WordPress would be taken offline). Do you know what was invented 100 years ago? Motorized film cameras — the replacement for the hand-cranked ones. If patents were valid as long as copyrights, the motion picture industry would still be paying patent fees to the great-grandchildren of Kazimierz Prószyński. Copyright laws were originally designed to protect artists but have since degenerated into corporate welfare. Works of art and cultural icons should become part of public domain in reasonable time, before we and our children die. So why don’t we start writing letters to our representatives asking them to abolish Mickey Mouse laws and settle on something that would actually encourage creativity. It’s time to release poor Mickey from the corporate prison.